Situated in the 'greenest' part of Moscow, Russkoye Podvorye (Russian Courtyard) incarnates true Russian traditions and beauty in all their glory. Light interior and carved vintage cupboard fill the five banquet halls with comfort and warmth, and the large menu of royal meals by Chef Anton Lutsenko is favorable for a feast, no matter what you celebrate - happy wedding or all-right party. Russkoye Podvorye's cuisine is specific for intertwinement of ancients Russian recipes and spirit of modern time. The Chef Lutsenko is beyond compare in both Russian and international cuisine. Graduated from Cooks Academy in Dublin, he was honing his skills in the best restaurants of Ireland, Spain, and Russia. But the dream to revive national culinary traditions and to create a new Russian cuisine has finally led him to Russkoye Podvorye. Salted honey fungus, sour eggplants, tender forshmak with herring, pelmeni with salmon served with cream-caviar sauce, brand salad 'Podvorye' and pike patties are just a few masterpieces from the restaurant's menu. The craftsmen of Russkoye Podvorye devote special attention to the ancient techniques of cooking as well: smoking and soaking in cast iron and ceramic pots. The restaurant serves its guests home-made fruit-drinks and sbiten (hot Russian drink) of Altaian herbs with jam. Six different halls make the restaurant multifunctional and comfortable for hosting all kids of events, be it a wedding, a romantic date, or a business meeting. The Festive Hall is the biggest one here - 85 sq meters provide seats for up to 60 guests. The hall is equipped with a stage and professional audio system and perfect for celebrating weddings and birthday parties. The Special Hall is designed in a very elegant style. Equipped with a projector, independent audio and video systems, and a separate entry, the hall is suitable for business events. If you want to feel homeliness and romantic atmosphere, you should choose the Chimney Hall. The Library with its cozy ambience is designed for warm meetings with friends and business partners. Karaoke Hall has everything you need to bring you vocal talent to light and have a tremendous time. 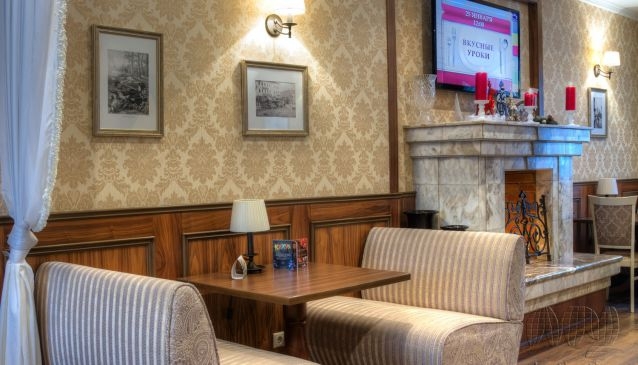 In summer time, Russkoye Podvorye strongly recommends you to visit the Terrace surrounded with lush greenery, enjoy a delicious dinner or watch sport events. The Terrace (100 sq meters) can serve as a venue for drink reception. The restaurant offers you arranging any event one can imagine: outdoor catering, weddings, birthday parties and master classes for kids and teenagers, magic shows and discotheques. Each Friday you have a chance to enjoy live music from 80s - Russian songs and Jazz. If you like to play table games, just gather your friends and choose the game: chess, monopoly, loto or scrabble.